Two things: I feel like I’m playing six degrees of separation with this feature. Week one I had Bridget Jones’s Diary, where Hugh Grant is the love interest; week two I featured Notting Hill, where Hugh Grant is the love interest and Julia Roberts is the heroine; and this week, I’m featuring Runaway Bride, which stars Julia Roberts (and Richard Gere). Since I have a lot of specific favourite movies and actors, it would be fun to keep this theme going, but I think the pattern will be broken next week. Second thing: I’m not going to lie, one of the (many, many) reasons I love Runaway Bride is because it opens with a U2 song. If you know me at all, this shouldn’t surprise you. Aside from that, this truly is one of my favourite movies. Confession time: I was about six when Pretty Woman came out (yes, my parents let me watch it) so I’ve loved Julia Roberts and Richard Gere together for most of my life. Skip ahead nine years to Runaway Bride, and I remember being thrilled we were getting another movie with these two together, especially one headed by the same director, Garry Marshall (who was a creative genius, and whose movies you’ll see featured many more times here). I love the ease these two have together, not to mention the chemistry. Seeing them together again, especially in something lighter and funnier, didn’t disappoint. This movie came out 18 years ago, and I still watch it on a regular basis, and still love watching Maggie and Ike deny their feelings for each other even as they fall in love. Maggie: Do you think there's one right person for everybody?Ike: No, but I think attraction is too often mistaken for rightness. Attraction is very misleading. I love Maggie. I think a lot of women can relate to her - probably not the multiple failed attempts down the aisle, but her reasons behind those failed attempts. Maggie doesn’t know herself. Coming from a small town where everyone knows her business, having to quit college to help her dad after her mom died, and having everyone know her mistakes and hold them over her head, she’s had to be what everyone expects. She’s lost, confused, and doesn’t have a clue who she really is. When I was walking down the aisle, I was walking toward somebody who had no idea who I really was. And it was only half the other person's fault because I had done everything to convince him that I was exactly what he wanted. I love the egg analogy - Ike discovers that Maggie always likes her eggs however her fiance likes them. With each new guy, her preference changes. I never got the full impact of this until a couple of years ago when I realized I have a friend who does something similar: each time she's in a new relationship, she practically becomes the guy. She takes on his traits, his interests, and completely loses herself - the things that make her unique, her hobbies, etc. She’s a strong, smart, independent woman, so it’s always been shocking to me that she continues this pattern, just like Maggie did, thinking she’s being ‘supportive’ and not realizing she’s losing herself bit by bit. The difference is that Maggie realized what she was doing and did something about it. She became whole and learned who she truly was before she finally fully committed to someone else. You want a man who'll lead you down the beach with his hand over your eyes just so you can discover the feel of sand under your feet. You want a guy that'll wake you up at dawn. He's just bursting to talk to you. Can't wait another minute just to find out what you'll say. Am I right? Besides Maggie and Ike, I love all the little details of this movie. The backdrop of Hale, Maryland (it kind of reminds me of Gilmore Girls’ Stars Hollow - tiny, idealic, everyone knows everyone else) and the fact it’s autumn combine to make an utterly charming setting. The side characters are fantastic; Joan Cusack in particular shines in this movie. I love how when you watch a Garry Marshall movie, you know you’ll see a lot of familiar faces, like Hector Elizondo, Larry Miller, plus Garry’s wife, children, and even grandchildren. There’s always something so comforting and heartwarming about watching a Garry Marshall movie, like you’re being reunited with family and friends, laughing and having a good time, and also having your heartstrings tugged along the way. I also love the Runaway Bride soundtrack - songs like I Still Haven’t Found What I’m Looking For by U2, Ready to Run by the Dixie Chicks, Maneater by Hall and Oates, and Blue Eyes Blue by Eric Clapton pull this movie together perfectly. I think the most that anybody can honestly say is: Look, I guarantee there'll be tough times. I guarantee that at some point, one or both of us is gonna want to get out of this thing. But I also guarantee that if I don't ask you to be mine, I'll regret it for the rest of my life, because I know, in my heart, you're the only one for me. Now, can we have another Julia Roberts-Richard Gere collaboration, please? Do you like Runaway Bride? Who's your favourite character? Do you have a favourite quote? This one was never a favorite but I'm not sure why. It's got a great message. I'm still struggling to find myself and it sure doesn't help my marriage. Would have been helpful to figure it out before I guess. 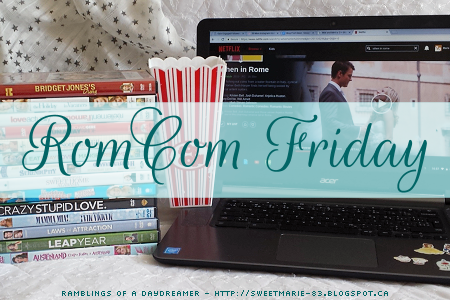 I totally remember when Julia Roberts was the IT girl and she made so many movies, and a lot of them were awesome rom-coms. I loved this one, but It's been so long since I have seen it. I liked Gere in this one too, because he has those two side - the broody hero and the lighter, fun hero. I like when he plays fun. Yes! I think that's probably why Julia Roberts is one of my top favourite actresses - I was a teen when so many of her movies came out and I loved them, and her. 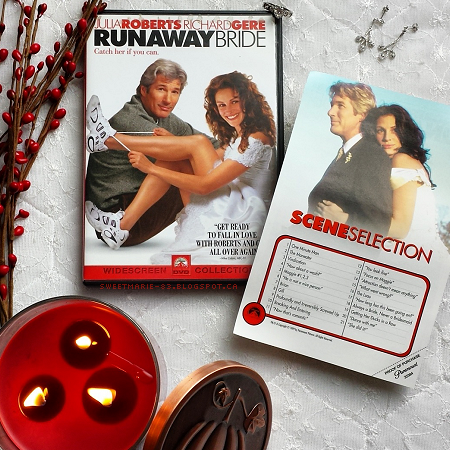 And I totally agree about Gere - I love seeing the lighter, fun, funny side of him in Runaway Bride.